We put six of best 4K screens through their paces. For the best part of a decade, 2K was the prevailing production norm. But in the last couple of years it has been increasingly difficult to stick at this resolution, as film production has shifted to 4K monitors, 5K, and even 6K. The 2012 Olympics even saw some early testing of 8K television cameras. If you’re going to produce 3D art content for the market from now onwards, you will need to have the ability to produce in 4K, and preview results at this resolution. Here, we're going to look at six monitors that can give you the 4K experience, with a range of sizes and prices on offer. 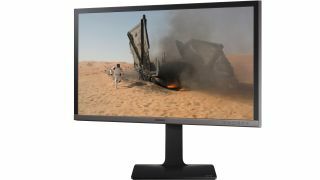 It is now possible to purchase a 4K monitor for as little as £250. But screens at this price will primarily be aimed at consumer usage, and won’t be best suited to professional 3D content creation. Primarily, this will mean colour accuracy won’t be guaranteed to an adequate level, but could also imply deficiencies in a number of other areas. However, the screens start at £350, up to nearly £1,000 ex VAT, so there is something here for every budget. The first thing to consider is what 4K actually means. This just refers to the horizontal resolution, and in digital cinema is natively 4,096 pixels across, with 2,160 pixels vertically. But the TV version maintains the 16:9 aspect ratio, and only offers 3,840 by 2,160 pixels. Virtually all 4K monitors use the latter resolution, although 5K monitors are also starting to emerge, in particular from Dell. While LCDs have generally come in a variety of technologies, including TN, IPS and IGZO, flavours of IPS are usually the norm in the professional space, including Samsung’s variant PLS. The TN panels have faster response rates, as low as 1ms, but IPS panels are usually more like 4ms, or even higher, making them slightly less optimal for interactive activities like games. But colour fidelity is usually a lot better than TN panels. Whatever the screen technology used, cheaper 4K panels could also offer lower refresh rates, such as 30Hz at 4K, rather than 60Hz or above. This might be fine for static graphics work, but will lead to less smooth-looking motion. It’s also worth considering how the monitor displays colours, including the bit-depth of the display itself and that of the signal processing beforehand. Most screens are at least 10-bit with 12-bit processing, but premium screens can go higher. Of course, all of these are on-paper specifications, so we have also tested each of the screens with PassMark’s MonitorTest software, which provides a series of patterns designed to reveal the quality of a screen, as well as displaying a selection of bitmap images, video and 3D models for more subjective testing. Read on for our results. Asus sent us two screens, and despite both being 32in and having very similar names, they are actually more different than you would imagine. The PA328Q is cheaper and offers a broadly similar specification to other 4K screens, beyond the screen size. One of the key differences between the PA328Q and its more expensive sibling is that the former calculates colour in 12-bit, while the PA329Q uses 16-bit, although both have 10-bit displays. It still manages to offer 100% sRGB and Rec 709 support. There are the usual swivel, tilt, height adjustment and portrait pivoting options. The DisplayPort and Mini DisplayPort connections are 1.2 standard, with two HDMI 1.4 and a single HDMI 2.0, but no DVI or VGA. Although this is the cheaper of the two Asus monitors, colour uniformity across the screen is already excellent, partly due to brightness uniformity compensation being available as a menu option. There is some banding visible with red and green gradients, as well as white, although not with blue. Gamma wasn’t reading quite as high as the setting implied during our testing, however. The Asus PA328Q has the slowest response at 6ms on this test, and this was discernible if you looked closely at the moving rectangles screen in MonitorTest, or the video we used for more subjective assessment. However, the text test in particular shows that 32in is a very natural screen size for 4K. So if you can afford the extra cost of this much screen, the PA328Q is definitely a contender. The PA329Q is the second 32in entry this batch from Asus, and although the housing is nearly identical in outward appearance, with just a gold strip rather than a red one along the bottom of the bezel, the circuitry inside has been considerably improved. In particular, colour is calculated as 16-bit internally, rather than 12-bit before reaching the 10-bit display. The greater underlying bit depth means that the PA329Q can boast 99.5% Adobe RGB, as well as 100% sRGB and Rec. 709, plus 90% of DCI-P3 wide colour gamut, and support for Rec. 2020. It’s also factory pre-calibrated. There are subtle differences in connectivity, too, with four HDMI 2.0 alongside the DisplayPort and Mini DisplayPort 1.2, five USB 3.0 ports and an SD card reader on the edge of the bezel. Single colour uniformity across the screen is excellent, with no noticeable change even at the edges. Like the PA328Q, there is a compensation option to help this. Red and blue gradients show no signs of banding, with only very minimal evidence in green and white. Overall, the PA329Q provided the best image quality on test, with colourful images having a subtle extra level of richness. The 5ms response also means that the ghosting on moving objects is less visible than with the PA328Q, for marginally better production of moving imagery. So although this is the most expensive screen in this test, it does at least provide enough visual quality to warrant the price. If you want the best colour, it could be worth the extra. The BL2711U is a 27in 4K IPS screen from BenQ with specific preset modes aimed at CAD/CAM and animation, and a 10-bit screen. It offers 100% sRGB and REC 709 colour spaces, and even has certification from Dassault Systèmes for use with SolidWorks. The stand enables the screen to be raised by up to 140mm, swivelled 45 degrees in either direction, and tilted up 20 degrees or down five degrees. It can also be rotated into portrait mode. There is a single Dual-Link DVI connection, one DisplayPort and two HDMIs (one 1.4, one 2.0 only), with the ability to put the image from one input inside another, but no legacy VGA is included. There is a four-port USB 3.0 hub, though. When assessing with MonitorTest, there is a slight darkening along the bottom edge with images of uniformly bright colour, as well as white. Graduated blue and red is very smooth indeed, although green and white had a very slight hint of banding. Very small text was extremely clear. Overall, image quality is very good, but not completely perfect. The BenQ BL2711U is a good all rounder for content creation. It has commendable performance with a few minor niggles, and the response rate of 4ms – which is about the best we normally see from an IPS screen – should enhance its abilities at tasks like video editing that benefit from a faster refresh. At £399.99 plus VAT, it’s very keenly priced for a 27in professional screen. The 241P6VPJKEB is a 23.8in 4K monitor aimed at professional applications, although not just 3D content creation. It uses an AH-IPS panel, which is a variant of IPS with improved colour accuracy, resolution, and light transmission alongside lower power consumption. This is the smallest screen in this test, and the cheapest. The base allows for 130mm of height adjustment, tilting from -5 to +20 degrees, swivelling from -175 to +175 degrees, and can be pivoted into portrait orientation. Connections include VGA, DVI-Dual Link, DisplayPort, and HDMI 2.0, with MHL 2.0 support. The built-in three-port USB hub is 3.0 standard, so won’t slow down any external storage devices you attach. There’s even a built-in webcam and mic – handy for those collaborative Skype calls. No glaring problems emerged during our MonitorTest session, with deep blacks across the full extent of the screen, and solid colours mostly rendered uniformly. There is a slight bit of backlight bleed around the edges of a solid blue screen, but not with solid white. Graduated colours are rendered perfectly. However, there is some unusual discolouration in curved lines, but changes in contrast are clear and small text readable, eyesight permitting. Performance is not without the odd fault, and 4K is a lot of pixels to pack into a 24in screen. Philips only claims 99% of the sRGB colour space, where some others promise 100%. It has a 5ms response rate, which is slower than some and there is slight evidence of this in fast-moving content. But the £350 price is reasonable for a professional screen, especially given the extras like the built-in webcam. The Samsung U24E850R is the third 32in monitor in this group, although the actual screen diagonal is 31.5in. It uses Samsung’s alternative to IPS technology, called plane-to-line switching (PLS), which the company claims has some advantages over IPS. One of these is cost, which is borne out by the fact that the U32E850R is the cheapest 32in panel. The U32E850R offers 97% sRGB gamut, which is a little off some of the best on offer, and Adobe RGB only stretches to 80% – quite a bit less than the Asus PA329Q. Connectivity includes two HDMI ports, one DisplayPort, and one Mini DisplayPort, with no DVI or VGA. There’s a four-port USB hub, but no built-in memory card reader. Despite having a lower price than other 32in panels, the U32E850R exhibits commendable performance. Black, white, red, green and blue are all extremely uniform across the screen, and there is only a very mild, almost imperceptible darkening along the bottom edge of an all-white display. Graduated colour is similarly very smooth, with just the faintest sign of bands in green and white graduations. With a relatively speedy 4ms response rate, this is one of the best screens on test for watching motion media as well, which was obvious from the pixel persistence test. Although this is the cheapest 32in 4K screens, you still pay a notable premium over the smaller screen sizes – you could almost purchase two BenQ 27in units for the price of one 32in screen. Nevertheless, with great image quality, the U32E850R offers the best value in its class. The ViewSonic VP2780-4K is our second 27in screen, and has features to put it above BenQ’s alternative, but also a significantly higher price. While the screen is still 10-bit, colour is calculated to 14 bits of precision internally, so 80% Adobe RGB, and 99% EBU, can be offered alongside 100% sRGB gamut. The VP2780-4K has ditched legacy DVI and VGA in favour of providing three HDMI 2.0 connections, two of which support MHL, plus a single DisplayPort 1.2a and Mini DisplayPort. There’s height adjustment of 150mm, tilt from 23 degrees up to five degrees down, 60 degree swivel, and the ability to rotate into portrait mode. The screen is very uniform with black, white, red, green and blue, showing only very mild variation at the edges. Very minor banding is visible in some of the graduated screens. The higher bit depth internal processing is discernible with richly coloured images compared to BenQ’s 27in entry, with excellent fidelity. The 5ms response rate isn’t the fastest here, but is par for the course for IPS panels. Compared to the 4ms panels, there was a little bit more edge blurring in fast moving screen elements. This is an expensive screen – 50% more than BenQ’s 27in entry – so while overall performance is excellent, the ViewSonic VP2780-4K is not such good value. This article was originally published in 3D World magazine issue 212. Buy it here.